'The Frame of Reference: At the Hirshhorn. Struth's watchful photos', in: 'The Washington Post', June 10 1992 (another from the edition illustrated, p. 82). 'Thomas Struth: Museum Photographs', Hamburg 1993 (another from the edition illustrated, pl. 3). 'Quotations in Art from Michelangelo to Hitchcoch', Kibbutz Auzorea/Israel 1997 (another from the edition illustrated, p. 7). 'Unfinished History', Minneapolis 1998 (another from the edition illustrated in colour, p. 33). 'The Museum as Muse: Artists Reflect', New York 1999 (another from the edition illustrated, p. 119). 'B. Riemschneider and U. Grosenick (eds. ), 'Art at the Turn of the Millennium', Cologne 1999 (another from the edition illustrated in colour, p. 486). Influenced by the critical reading of the modernist tradition of Gerhard Richter and the objective photography of his professors, Bernd and Hiller Becher, Thomas Struth inherited their consistent impersonal approach, detached from the 'hand of the artist'. His straightforward photographs illustrate the mundane aspects of contemporary life. Interested more in collective sociology than in individual psychology, Struth records people's social behaviour in the context of the conditioning sphere of their surroundings. 'Musée du Louvre 4, Paris 1989' is from a series of large-scale photographs that Struth shot in important Museums from around the world, analysing the behaviour of the visitors within the context of the museum as a temple of art and mausoleum of artists. 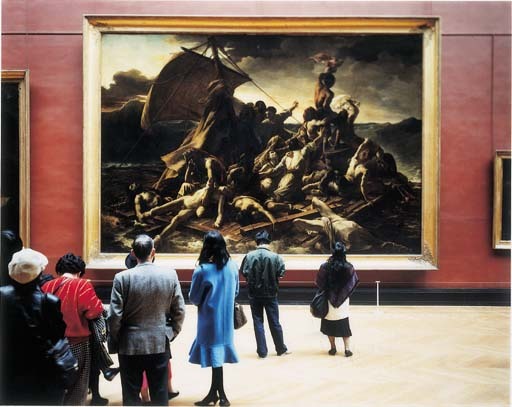 Here, a group of visitors depicted with their backs to the camera stand viewing Géricault's famous painting, 'Le Radeau de la Méduse' (The Raft of the Medusa), exhibited in the Louvre's French XIXth century Big Formats Gallery. The totally detached objective aspect of the scene contrasts strongly with the violent, passionate subject matter of Géricault's romantic painting. At the same time, however, the photograph's diagonal angle of view follows that of the painting's composition, suggesting a formal continuity between the real and fictive scenes. 'Musée du Louvre' depicts the act of looking at a work of art. Does the vision of a work of art act on the collective unconscious mind, influencing people and their behaviour? Are people in a museum as detached, as it seems? The beauty of Struth's photograph lies in the mysterious abstraction contained in the questioning void between the public and a work of art.